ABC has announced premiere dates for Marvel's Agent Carter and Galavant in addition to return dates for their most popular shows. ABC has announced premiere dates for their new series Agent Carter and Galavant, and they have also announced when shows like Once Upon A Time, Marvel’s Agents of S.H.I.E.L.D., Grey’s Anatomy, Scandal, and How To Get Away With Murder will return from their winter breaks. ABC announces premiere dates for two of its highly anticipated new midseason shows – “Galavant,” a comedy extravaganza and “Marvel’s Agent Carter,” the second action packed series from the creative minds at Marvel, inspired by the feature films “Marvel’s Captain America: The First Avenger” and “Marvel’s Captain America: The Winter Soldier,” along with the short “Marvel One-Shot: Agent Carter.” “Galavant” will premiere on SUNDAY, JANUARY 4 (8:00-9:00 p.m., ET) and will run two episodes in the one-hour block each week, and “Marvel’s Agent Carter” premieres on TUESDAY, JANUARY 6 (9:00-10:00 p.m., ET). “Once Upon a Time” will return on Sunday, March 1 and “Marvel’s Agents of S.H.I.E.L.D.” will return on Tuesday, March 3 in their regular time periods with all-new episodes. The hit TGIT Thursday night dramas, “Grey’s Anatomy,” “Scandal,” and “How to Get Away with Murder,” return Thursday, January 29. “Galavant” – Screenwriter/executive producer Dan Fogelman (“Crazy, Stupid, Love,” “Tangled,” “Cars”) unites with Broadway and Hollywood award-winning musical team—composer Alan Menken (“The Little Mermaid,” “Aladdin,” “Beauty and the Beast”) and lyricist Glenn Slater (“The Little Mermaid,” “Tangled”). Once upon a time, the dashing hero, Galavant (Joshua Sasse), lost the love of his life, Madalena (Mallory Jansen), to the evil King Richard (Timothy Omundson). Now, our fallen hero is ready to take revenge and restore his “happily ever after.” But it won’t be without a few twists and turns along the way. “Galavant” was written by Dan Fogelman, who also serves as executive producer. Executive producers are Alan Menken, Glenn Slater and Chris Koch. The pilot of “Galavant” was directed by Chris Koch. Abbey C Studios Ltd. produces “Galavant” for ABC Studios. 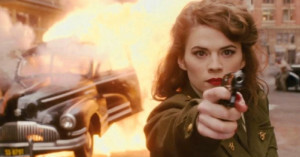 “Marvel’s Agent Carter” – It’s 1946 and peace has dealt Agent Peggy Carter (Hayley Atwell), a serious blow as she finds herself marginalized when the men return home from fighting abroad. Working for the covert SSR (Strategic Scientific Reserve), Peggy finds herself stuck doing administrative work when she would rather be back out in the field, putting her vast skills into play and taking down the bad guys. But she is also trying to navigate life as a single woman in America, in the wake of losing the love of her life, Steve Rogers – aka Captain America. When old acquaintance Howard Stark (Dominic Cooper, “Marvel’s Captain America: The First Avenger”) finds himself being framed for unleashing his deadliest weapons to anyone willing to pony up the cash, he contacts Peggy — the only person he can trust — to track down those responsible, dispose of the weapons and clear his name. He empowers his butler, Edwin Jarvis (James D’Arcy), to be at her beck and call when needed to help assist her as she investigates and tracks down those responsible for releasing these weapons of mass destruction. If caught going on these secret missions for Stark, Peggy could be targeted as a traitor and spend the rest of her days in prison – or worse. “Marvel’s Agent Carter” stars Hayley Atwell (“Marvel’s Captain America: The First Avenger,” “Marvel’s Captain America: The Winter Soldier”) as Agent Peggy Carter, James D’Arcy (“Master and Commander: The Far Side of the World”) as Edwin Jarvis, Chad Michael Murray (“One Tree Hill,” “A Cinderella Story”) as Agent Jack Thompson, Enver Gjokaj (“Dollhouse”) as Agent Daniel Sousa and Shea Whigham (“American Hustle,” “The Wolf of Wall Street”) as Chief Roger Dooley. Tara Butters (“Resurrection”), Michele Fazekas (“Resurrection), Christopher Markus (“Marvel’s Captain America: The First Avenger,” “Marvel’s Captain America: The Winter Soldier”), Stephen McFeely (“Marvel’s Captain America: The First Avenger,” “Marvel’s Captain America: The Winter Soldier”), Chris Dingess (“Men in Trees”), Kevin Feige (“Marvel’s Guardians of the Galaxy,” “Marvel’s The Avengers”), Louis D’Esposito (“Marvel’s Guardians of the Galaxy,” “Marvel’s Iron Man 3”), Alan Fine (“Marvel’s Captain America: The Winter Soldier,” “Marvel’s Thor”), Joe Quesada (“Marvel’s Agents of S.H.I.E.L.D.,” “Marvel’s Avengers Assemble”), Stan Lee (“Spider-Man,” “Iron Man,” “The Incredible Hulk”) and Jeph Loeb (“Smallville,” “Lost,” “Heroes”) are executive producers. “Marvel’s Agent Carter” is produced by ABC Studios and Marvel Television.